A fire in the building of the Mi Tierra Honduran restaurant displaced one family who lived in the apartment behind it. Photo courtesy of Steven Castellanos Jr.
A family of three was displaced Tuesday afternoon after a fire in the businesses below their apartment caused significant smoke damage. 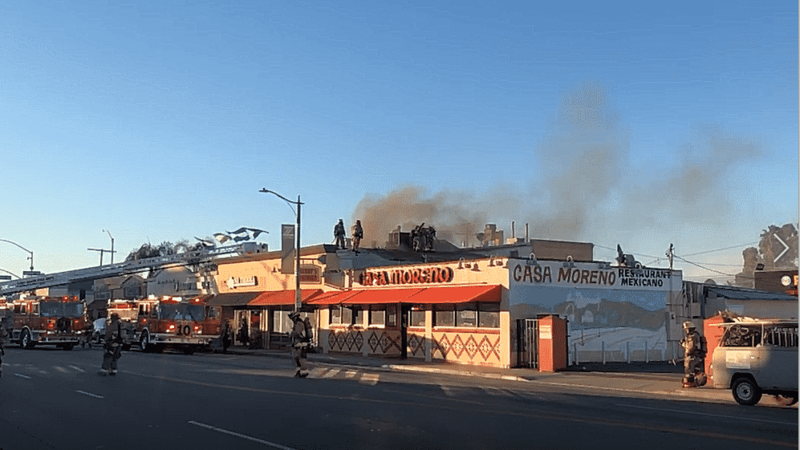 Long Beach firefighters were called to the scene of a two-alarm fire in a two-story strip mall on East Anaheim Street and Junipero Avenue shortly before 3:45 p.m. The fire was on the first floor of the building that Mi Tierra Honduran restaurant and an empty storefront occupy. Firefighters extinguished the fire within 15 minutes, Long Beach Fire Department Capt. Jack Crabtree said. No one was injured, but the smoke spread to the second-floor apartment above, making it temporarily uninhabitable. LBFD is still investigating the cause of the fire and the Red Cross is assisting the family to find temporary housing and meals.